Scooby Doo on Zombie Island was my first written DTV Wonder, and now I return to the early Scooby-Doo movies, and I have as much nostalgia for this film as most of The Land Before Time films. Jim Stenstrum is back as the director and Davis Doi is still producing and doing the story, but the writers are different. The main cast change is Grey DeLisle takes over as the voice of Daphne, a role which she had until 2013. This film came out in 2001. This is normally considered one of the best Scooby-Doo movies, and that is accurate to me. The opening trailers are very good when they are about movies. The Harry Potter and he Sorcerer’s Stone trailer makes me want to watch it again. The trailer to Pokémon 3 shows some cool Cyndaquil action, and the trailer to Grandma got run over by a Reindeer… well what else could it be? Then the toy commercials seem to have nothing to work with. At a strange lab some scientists talk about a laser. They are professor Kaufman (coincidently the name of one of my college’s buildings where I do most of my classes), Erik, and Bill. Besides Erik’s actor voicing Bucky the squirrel in The Emperor’s new Groove, none of their actors are important, which is fine for small roles like they have. Apparently the laser is broken, but then it just turns on after Bill presses some buttons and keeps pressing them (he is probably the villain), and then the Laser shoots the Phantom Virus into the world. While I have named him the movie does not until later giving the viewers a mysterious unknown villain. He is also able to absorb computer data and make electronics come to life as his minions so it ends with a close up of his pointy chin, as the professor and his students are trapped. This results in disappointment when the Mystery Machine is shown with the characters expositioning about their fried Erik making a computer game based off them instead of more of the college. We then have a bad mythology gag. When Fred says to split up Scooby and Shaggy leave before he says who will go with whom. Shaggy’s response is “Like we ever do it any other way.” In the first two seasons more often than not it was Scooby, Shaggy, and Velma in a group. Well after that Scooby and Shaggy proceed to eat the cafeteria dry, while Velma, Fred, and Daphne have a showdown with the phantom virus, and interestingly thanks to the magnet this time the gang is chasing the monster instead of the reverse. They are then caught by Officer Wembly who points out that they are in a restricted area and Kaufman never gave them hall passes. Maybe Kaufman is the villain. Well in what is probably he best part of the movie’s humor the phantom virus chases Scooby and Shaggy, which includes them using a robot against him (virus forgot he can control), and electrocuting him. Then they electrocute him again. Despite being able to control technology, hide in dust, and shoot lasers from his fingers, he seems surprisingly playful and inept, since this is not his world. They run by the rest resulting in the whole gang getting stuck trying to fin him. Then the laser is powered by a lab cat hand (further ruling Wembley out) beams them into the computer game. It is then revealed by Erik that the only way for them to get out is for them to get past all ten levels. The problem is they could still beam in a guide to the game, a walkthrough, or supplies. Level one is the moon level, where it is quickly established that they can still feel pain there, and presumably die. The story gets episodic here, as it is about them being chased by moon goons and the phantom virus, as in each level this is what they have to do in order to find a box of Scooby snacks. The story gets episodic because of it, and this is quite dull except for showing the phantom virus to now be a much larger threat, as he has allies and all of the magnets are stuck in the real world. Why put them down? Assuming Caligula was emperor at the time him being a dog is actually believable. They then get to the hardest level, three out of ten. Apparently to pass this prehistoric level the player must wander a huge forests where everything is trying to kill you, find the scooby snacks on an erupting volcano, have no knowledge beforehand that they are there, have the only clue being a drawing in a random cave, which the player may not go into, deal with it turning dark, and do it before the volcano erupts. This sounds insanely difficult, and I am wondering why it is level three instead of at least eight. It is actually the best level to watch and it begins with the phantom virus on a T-Rex. They escape it the same way as they did in The Land Before Time VI (which came out three years before this film, so I always assumed they had just watched it for inspiration), by hiding in the thick trees where it could not go. They eventually reach the volcano by wooly mammoth riding (apparently Erik programmed them to smell bad). Scooby heroically goes to save a baby pterodactyl, which it turns out was on top of the Scooby snacks. Then the film montages the next six levels, which all look considerably easier than level three until level ten. They are in a city, and they eventually find their older counterparts. I have no memory of Scooby wearing a red collar anywhere else, and Velma looks identical, but this is cool to see, as they meet Erik’s programed characters, especially how different their eyes are. In a nice reference they meet them in a malt shop, as most episodes of the first two seasons begin with the gang reading a newspaper in a malt shop. Fortunately they also know where the scooby snacks are. Apparently they are supposed to just wander a huge city until they get to the theme park where they are. Why not just make the theme park the whole level, as it is clearly big enough? Was this a plan to sell guide books, as this just sounds like boring grinding. They find the phantom virus in a batting cage, and then the creeper and many old Scooby-Doo villains that even I am unfamiliar with. At least the tar monster later showed up in Scooby-Doo 2 Monsters Unleashed. To make things worse they are all real monsters in cyberspace instead of normal people in masks. They then split up and have some surprisingly well written and good scenes with their older counterparts as they outwit the monsters to escape… twice. They then meet up at the arcade where the virus and Scooby snacks are, and it turns out Shaggy still has the magnet (that damages cyber creatures), and it affects the cyber mystery gang. How did he not feel that huge thing, and it should also affect the area and inanimate objects. In a finely done scene Fred says they should just use the magnet on the virus, and get the cyber gang to stay away outside the arcade. Instead Fred gets cocky and slips on a ball, and the magnet falls under a game. To make things worse the virus makes the game come to life, and its wires grab Fred. Now the virus is shooting lasers everywhere and controlling the objects to fly everywhere. It is amazing how much more intimidating he has gotten throughout the movie. 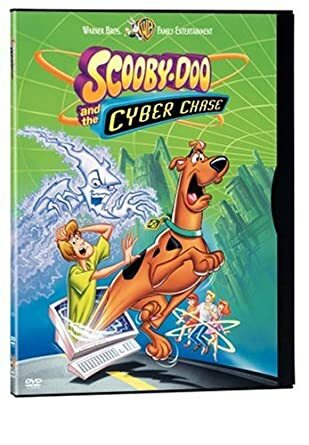 The cyber gang can tell something is wrong, but then the monsters from earlier chase them away except cyber Scooby who goes inside of the arcade. Fred gives him a plan which is for Cyber Scooby to mock the virus distracting him, while real Scooby gets the Scooby snacks. Shagy’s comment “…I’ve never seen Scooby acting so brave.” still bugs me. What about in level three? Well Scooby grabs them, and that defeats all the villains, and lets them go home. I cannot say the different Mystery Incs leaving is sad, but it is a nice end to the main part of the film. They arrive back to solve the mystery of… who created the virus. Frankly I would think it could be a Russian hacker, and it is hard to still care about it compared to the Cyber space story. Fred points out all the baseball references and Erik shows signs of guilt by fleeing instead of claiming to be framed. He is arrested and the movie ends at a malt shop as a nice call back to the original series and level 10. After that lots and lots of ads for the video game. As an adult this film is overly episodic and lacks focus. It makes little sense as well. As a kid this movie is stupendous. Everything about it is amazing, and all my siblings loved it too. Since children are the target audience I think that weighs more, so this is a great film, but without nostalgia I doubt any adult fans will like it.